Campaigners travelled across London on a “battle bus” on Saturday in protest against the corrosive impact of private finance initiative (PFI) contracts on Britain’s public health service. They warn hospitals in London are crumbling under toxic PFI debts. Part of a worldwide program of privatization and financialization, PFI schemes use private capital to fund public infrastructure development. They were first introduced to Britain in 1992. Saturday’s protest was organized by a collective of campaigners who argue public health services in Britain are collapsing under the weight of mounting PFI debts. 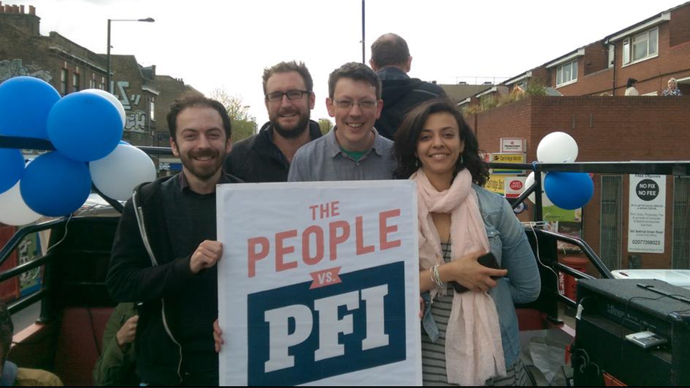 Activists travelling on the battle bus called upon the British government to address Britain’s PFI debt crisis. They also demanded it acknowledge that excessive debts generated through these schemes impact on ordinary taxpayers while wealthy investors profit. British taxpayers are estimated to owe roughly £222 billion ($337 billion) to banks and private firms under 720 PFI contracts. By 2050, the UK’s total PFI bill could amount to £310 billion ($470 billion) or four times the UK’s deficit, experts suggest. Critics warn these contracts are overpriced, shrouded in secrecy and - in certain instances - dependent on criminally rigged Libor rates. Campaigners who took part in Saturday’s demonstration insist failed attempts by British health trusts to cope with increasing PFI debts have bred acute crises in public hospitals across London. They cite Whipps Cross University Hospital as an example of the destructive impact of PFI contracts on local health services. Whipps Cross is one of six hospitals run by Barts Health National Trust. The largest health trust in England, Barts Health is bound by a 43 year PFI contract worth £1 billion ($1.5 billion). Since its founding, the contract has burdened the trust with debts of £93 million ($141 million). The extent of the crisis at Whipps Cross University Hospital was highlighted in a Care Quality Commission (CQC) report published in mid-March. The study unveiled damning practices at the hopsital, including poor quality Accident and Emergency (A&E) care, insufficient staff numbers, over-stretched staff, low morale, a culture of harassment and bullying, long patient waiting times, and a heavy reliance on agency employees. The health care regulator’s probe also revealed terminally ill patients had been offered sub-standard care, not enough priority was afforded to patient safety, and some patients were not offered sufficient medication to manage pain stemming from their ailments. In the wake of the CQC’s findings, Barts Health was put into special measures. It is one of 21 health trusts that have faced tough regulatory action from the Commission since 2013. Campaigners argue Barts Health’s PFI contract allows the private sector to overcharge British taxpayers as the trust’s hospitals take a hit. They say the trust’s mounting PFI debt largely stems from construction work carried out at its Royal London Hospital, and general maintenance elsewhere. Speaking to RT on Sunday, British academic and public health doctor AlysonPollock said Britain’s PFIs are drivers of “service closure and privatization” due to the “high cost” of servicing related debts. “In the case of hospitals, the debt sits on the hospital balance sheets,” she said. Pollock, a leading voice on PFI in Britain, said a full public inquiry is necessary to address Britain’s PFI crisis. She stressed the Treasury, National Audit Office (NAO) and Public Accounts Committee (PAC) must work together to ensure the UK's PFI deals advance the public interest. “Our taxes should pay for health care, not wealth care for big business,” he told RT. Singer stressed a sustainable solution is required to address the “massive payments” being funneled to private investors under Britain’s PFI schemes. “We want all the parties to tell us all how they will deal with the huge PFI debts – not just at Barts Health, but at every PFI hospital across the country,” he said.